Our popular multi-functional trouser and jumpsuit outfit in lightweight denim. Pockets down the side add style and utility. 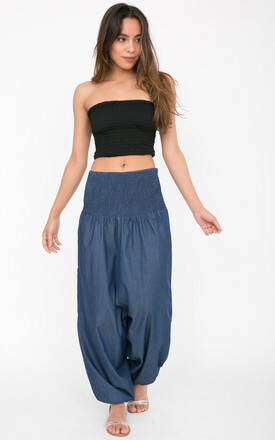 Wear as harem style trousers or as a comfy jumpsuit. Perfect to take on holiday. Versatile styling with flats or heels and accessorise with a belt.